Popsicles are the new buzz this summer in my kitchen. And the mint and pineapple popsicles are topping the flavor chart so far. The sweetness and tartness of pineapple combined with a notch of chaat masala and mint create a flavor bomb. 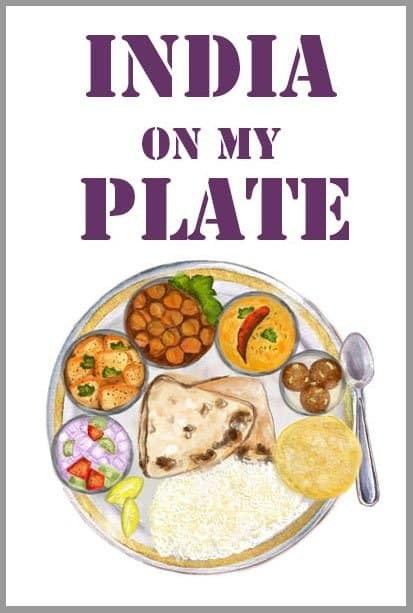 One bite and you will be reminded of kala khatta – a familiar Indian flavor which is hard to describe in words. A flavor so close to my heart. But this one is not exactly like kala khatta making it even more exquisite. So for anyone else who loves the combination of sweet and sour or who might need a little boost in the afternoon. 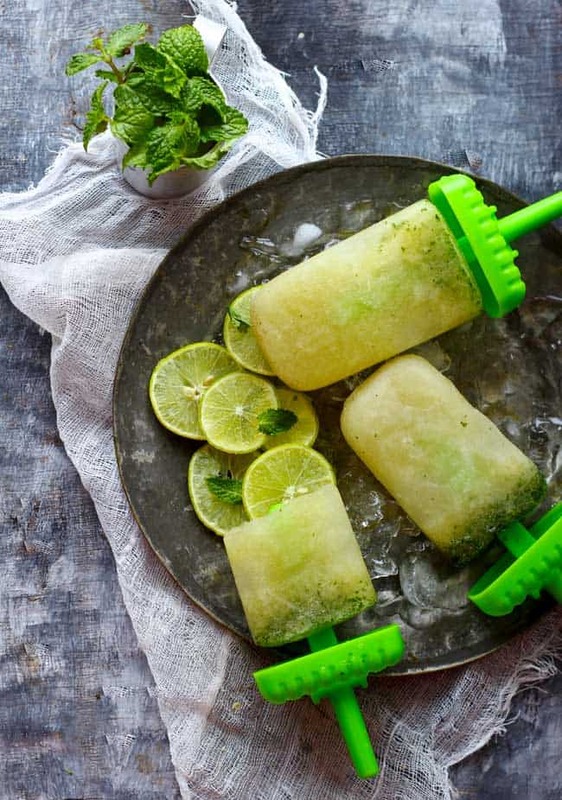 I’m happy to report that these mint and pineapple popsicles are both tasty and energizing. And just basically delightful. 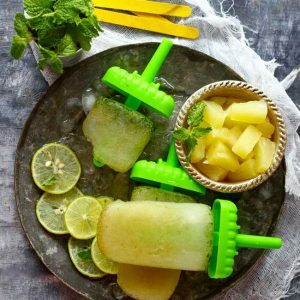 Technically you need 5 ingredients – pineapple, mint, juice, sugar and chaat masala, to make these delicious mint and pineapple popsicles. Also, get hold of a good popsicle mold. And then life is sorted at least for the summers. You can blend favorite flavor combinations of your choice and keep ‘popping’. Once you’ve tracked down the ingredients and a suitable popsicle maker, these are stupid easy to put together. These frozen treats are my favorite desserts for the summer parties. When I do them for the adults, I add a notch of vodka to make them little boozy.These icy popsicles are a snap to make. The tartness of pineapple is perfectly pitched with little sweetness and spiciness. Its strong flavor can be overwhelming at the first bite, then slowly you start liking it and finally craving for the second round of pops. It is positively intoxicating. Are you guys as excited as I am? We are rolling out our second food video. I’m super excited about taking these baby steps towards vlogging. In case, you missed the first recipe video, you can watch it here. And yes, there will still be lots and lots of amazing quick, simple and fun video recipes rolling out soon. Until then, keep popping mint and pineapple popsicles. 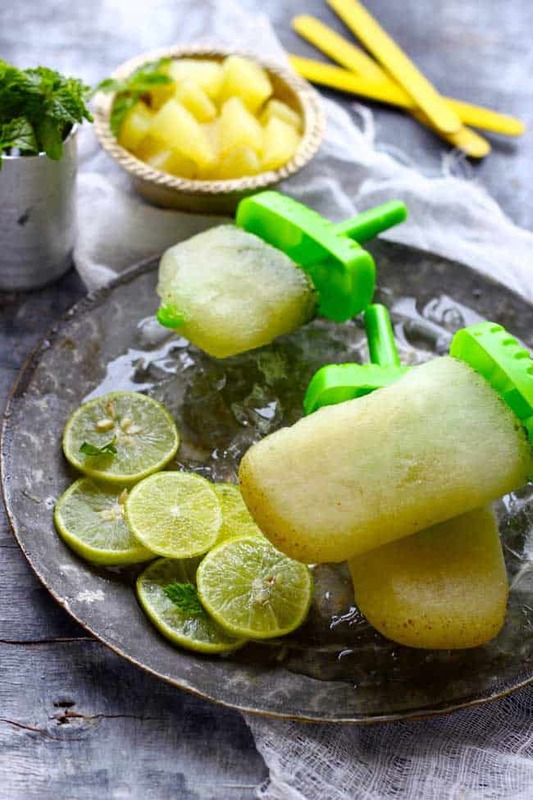 These Mint and Pineapple Popsicles are easy to make and require only 15 minutes. Perfect for kids during the summer holidays. Learn how to make easy fruit popsicles in few simple steps. Combine pineapple, mint leaves, sugar, chaat masala, cumin powder and lemon juice in a blender. Add pineapple juice as well in the blender. Blend all the ingredients together to a smooth consistency. Taste and adjust the amount of sweetness accordingly. Pour the liquid into the popsicle molds. Freeze till set. Approximately 3 - 4 hours. To remove, dip each popsicle in hot water for 20 seconds or so, then remove. The popsicles will keep, frozen airtight, for up to several weeks. 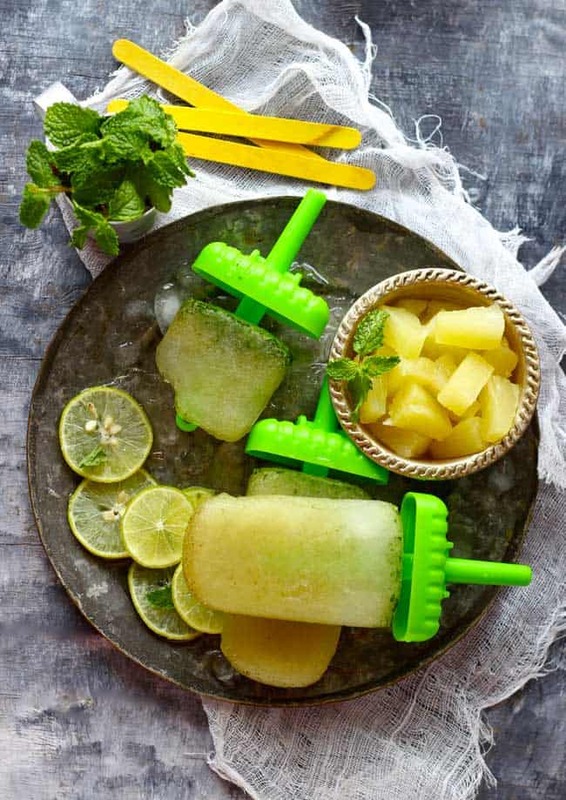 Serve Pineapple and Mint Popsicles chilled on a summer afternoon. Love the video Hina! And these popsicles sound and look so refreshing! Popsicles look very refreshing. It reminds me of my son, who is very fond of popsicles and tries his own versions with whatever he lays his hands on. I am sure this will inspire him to try it soon. Video is very beautifully made. Thank You. Hope your son likes them. Please do try the recipe. The popsicles are such a lovely idea….look so good and such a great way to cool off on a got summer’s day!